Crude oil can be seen as the big winner of 2016 with a 50% price increase per barrel of Brent. It was closely followed by animal fat (cat 1 and 3) and palm oil whose prices also went up significantly last year, by 30% to 40%. The prices of soybean and rapeseed oils increased by 11% – 17%. UCOME and TME biodiesel also saw an upwards trend of more than 22% across 2016 and used cooking oil prices followed the same tendency to finish the year with a fanfare. The only product that did not perform very well between December 2015 and 2016 was waste-based glycerine. The margin of UCOME producers rose by about 12% (+ 25 € / MT) in 2016 compared to 2015 due to an increase in the price of FAME. At the same time, the TME margin declined by 7.5% (-30 € / MT) which was caused by strong sourcing competition on the animal fat cat 1 and 2 market. However, the margin of UCOME producers should decrease in the next year due to shortages of UCO on the market. The same is true for TME as the production capacity in Europe increases while feedstock supply remains limited. Biodiesel production margin will be also impacted by the low glycerine price and mostly by a strong increase of methanol price. 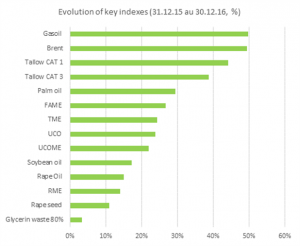 Palm oil prices rose sharply in the course of 2016. During the last two quarters of the year the increase was 20% (average price FOB Rotterdam in USD per ton). This is mainly due to the decline in production following severe droughts caused by El Nino and strong worldwide demand for vegetable oils. In 2017, improved palm crops and increased competition from soybean oil following good US crops should put palm oil prices under pressure. In order to maintain its market share among major Asian buyers such as China and India, palm oil will have to keep a sufficiently large price gap to soybean oil. There is also prediction that supply will surpass demand but the final effects of all these factors on the price of palm oil will be visible only in the second half of the year when the stocks in Malaysia and Indonesia are confirmed. Soybean oil prices are expected to continue its upwards price trend in the first months of 2017. In 2016, they increased by 15% (average CBOT price in USD per ton). However, the recovery of palm oil production and expected higher output than demand of soybean should put pressure on soybean oil prices in the second part of the year. The decline in the world rapeseed production in 2016 (-1.3 million MT) is expected to continue over the 2016/2017 season and go down to around 68 million tons (-3.5%). The demand should remain stable leading to a reduction in stocks (-15% to 5.5 million tonnes) while the prices should remain at levels above 400 euros per ton. This will support the price of rapeseed oil which is at its highest level since July 2014 (above $910 per ton in Rotterdam). In the second half of the year, rapeseed oil prices are also expected to follow the downwards trend of the oilseed complex. It would be surprising if the price of oil jumped again by 50%. Even though OPEC countries agreed to cut their production (1.2 million barrels / day), at $55 a barrel, US shale oil is profitable again. So, the US production will certainly see an increase especially that Donald Trump will not be the person to put the American oil sector at halt. In 2017, the waste-based biodiesel sector in Europe will be significantly affected by the shortages of feedstock, both locally and from overseas. The resources of UCO in Europe are limited and UCOME producers depend on imports for their feedstock supplies. However, with an increased local demand for UCO in the US and in China due to new biodiesel investments there, the quantities available for export to Europe may decrease. US biodiesel market should be watched carefully as only in 2016, they produced 8,6 million tons. Although the EPA’s growth prospects and mandates are moderate, local demand for waste-based feedstock there will definitely remain strong. To sum up, we expect the market of veg-oils to remain bullish during the first two quarters but then the trend is likely to reverse in the second half of the year. The oil market should stabilize on its current levels while the euro index will, most probably, remain low. In this context, the market for first-generation biodiesel is expected to continue its increase at the beginning of the year and to stabilize over the rest of 2017 or even to correct itself following the downwards movement of vegetable oils. The second-generation biofuels market, although indexed to first-generation biofuels, should be increasingly pressurized by the scarce supply of waste-based feedstock: used cooking oil and animal fat. The double counting evolved from 1.36 to 1.32 on average between 2015 and 2016 and this trend should reverse in 2017 mainly due to the rising cost of raw materials and their limited availability. Let’s wait and see what challenges will come in 2017. Our best wishes for the New Year to everyone!